New Orleans came right back and evened the game at 1-1 in the second inning. Nashville starter Trevor Cahill momentarily lost command and issued three walks in the frame, including forcing in a run on a free pass. An error in the bottom of the fourth proved to be the difference in the game. With two outs and runners at second and third, Cito Culver’s groundball to third was handled by Steve Lombardozzi but his throw was off line and allowed Eric Campbell to score and make it a 2-1 game. 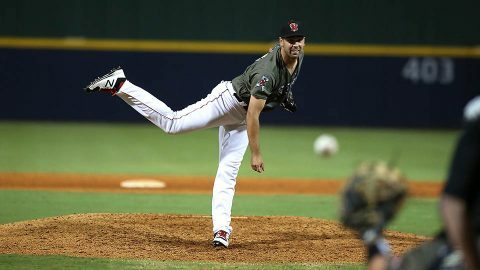 The lead held for New Orleans as the Sounds managed only two hits over the final five innings – a single by BJ Boyd in the fifth, and a single by Beau Taylor in the eighth. Trevor Cahill started for Nashville and went four innings. He was tagged with the loss after he allowed two runs (one earned). The bullpen trio of Lou Trivino, Jake Sanchez and Bobby Wahl threw four perfect innings in relief. Nashville and New Orleans continue the five-game series Sunday afternoon at Shrine on Airline. Left-hander Eric Jokisch starts for the Sounds against right-hander Tyler Cloyd for the Baby Cakes. First pitch is scheduled for 1:00pm. With tonight’s loss, the Sounds fell to 1-2. They are two games back of the American Southern Division leading Memphis Redbirds. Relievers Lou Trivino, Jake Sanchez and Bobby Wahl combined to throw 4.0 perfect innings in relief tonight. The bullpen ERA on the young season is 0.59 (15.1 IP/1 ER). After going 6-for-12 with runners in scoring position in the first game of the season, the Sounds are just 2-for-15 with runners in scoring position over the last two games. Right-hander Trevor Cahill went 4.0 innings (L, 4.0 IP, 3 H, 2 R, 1 ER, 3 BB, 3 K) in his first start of the season.